Of all other things that keeps me worried, one major concern that remains is- what if I am laid-off by my employer? Losing my job not only stops my earning until I have found myself a new one, but also puts my family’s happy dwelling at stake. Things get worse when I haven’t been able to find a replacement. Of course, all of us do calculate these risks and keep ourselves prepared for the high priority life requirements. Yet, there are these sudden occurrences, like some illness or accident, which we cannot calculate from before and stay absolutely prepared. Situations such as these call for investing in health insurance etc. We all as employees receive some sort of employer-sponsored health coverage for our protection and our immediate family. The fact is that most of the working population in USA depend on their health insurance plans that their companies provide. For those with employer-sponsored health insurance plans, there is always a fear of losing the coverage in case the job is laid. 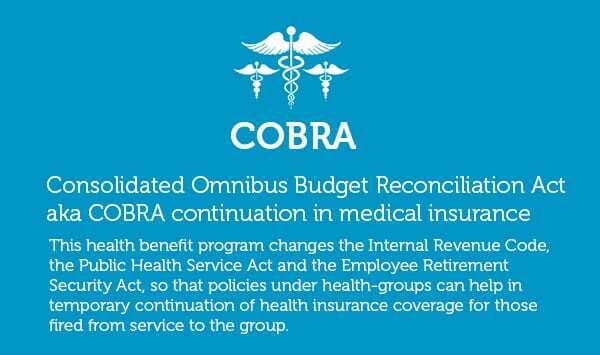 It’s here that the employees need to thank COBRA (Consolidated Omnibus Budget Reconciliation Act of 1985). This Act has helped many fathers stop worrying how he will afford emergency healthcare for his children when he has no job, hence, no family coverage. There was a time when a health insurance covered by the employer, in other words, a corporate health insurance plan, provided no relief to the employee. The employee was always concerned about his and his family’s medical coverage in the event he was fired from job, got divorced, or changed jobs. In the event of employee covered under COBRA, if he is losing group insurance due to changing life events, he can still continue to remain under his employer’s group health insurance plan. However, he has to pay the entire premium amount (including employer contribution) for a limited time (18 months). Family and medical leave Act (FMLA)- This act can be confusing for employees at times. The act mandates the employer to provide 12 weeks of work-time off (unpaid) within a period of 12 months. This leave is to help employees protect themselves from getting fired while caring for them or their immediate family’s health. The act includes child birth, also placing for foster care or adoption of a child. The FMLA allows the employer the discretion of offering either unpaid leave or paid leave as an optional benefit plan as well. Compensation for workers- This offers insurance benefits to all those employees who are taken ill while they are employed. The benefit also goes to those who get injured while at work. The health insurance plan differs according to state and the dictations are made at state level. Certain states also mandate employers to buy disability insurance. Taxes (Social security)- The tax has to be paid on the employees, the current rate being 6.2%. This tax is jointly paid by both the employer and employee. An addition of 1.45% is added as Medicare tax. Unemployment Insurance- This health insurance plan offers compensation to employees who have lost jobs for no fault of theirs. The state is at discretion to implement the caps for the unemployment insurance plans. This necessitates the employer to register his company with the workforce agency of his state. It is at this agency where he is informed about the state’s requirements. Help is not far away, nor it is very difficult to receive. However, you must keep yourself abreast of whatever is happening around you and your workplace. A health remains a major concern for all, it is always better to find out what kind of support can come your way through the place that employs you. As for COBRA, you need to decide if you wish to contribute a little more only in case of the need to arise, or you remain uninsured and under constant paranoia of risk befalling on you.